UC San Diego Health’s uniquely designed geriatric emergency department is installing specialized LED lighting in its pioneering new ED, a move it says will be helpful for clinicians working lengthy overnight shifts – and also help with the detection and diagnosis of dangerous conditions such as sepsis. 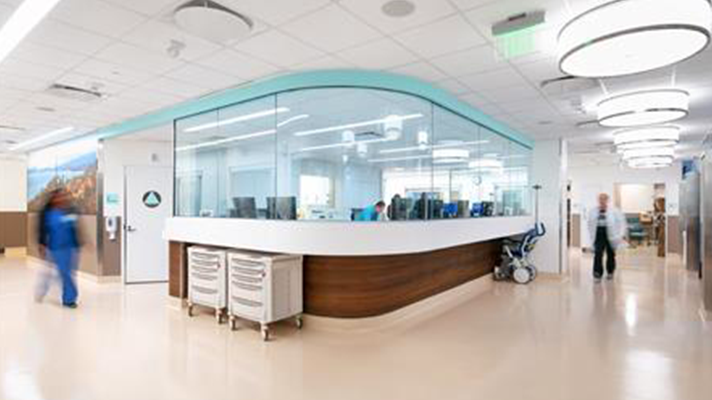 The Gary and Mary West Emergency Department at UC San Diego Health in La Jolla, California, opened this past January. It’s billed as the first in California to treat patients over the age of 65 in a space that’s customized for geriatric emergency care. It’s one of just a handful of such facilities in the United States. In contrast with the harsh lighting, overcrowding and noise of many traditional emergency rooms, the specially-designed ED at UC San Diego “allows older adults to be cared for in an environment that better meets their needs than a traditional emergency room setting,” Dr. Vaishal Tolia, medical director of the Department of Emergency Medicine at UCSD, explained when the space first opened. The space has architectural features and designs with seniors in mind, such as high-backed chairs in the waiting room, a nursing station visible from every room, gentle acoustics and sound-absorbing walls. The company says the lighting will help both patients and staff at UCSD in two ways. It can boost circadian signal to help keep patients alert during daytimes and help maintain that alertness for physicians and nurses during long shifts. In addition, the LED wavelength can help with the visual assessment of certain patients, officials said. UCSD’s geriatric emergency department, with all the technology and design innovations it entails, is an example of the kind of forward-thinking approach health systems should be embracing as they prepare for the “Silver Tsunami” of aging Baby Boomers. Managing that new paradigm, after all, is not just about delivering higher-quality care at controlled cost, even as workforce shortages and scarce resources make that task a challenge. It’s about giving an optimal patient experience – not just because it’s the right thing to do, but because that increasingly tech-savvy generation comprises many discerning consumers, and doing so offers a competitive advantage in a crowded market. “Senior patients face common complications, such as being at a high risk for falls and cognitive and memory problems. All patients in the (senior emergency care unit) are treated by a team with special training in geriatric medicine, including pharmacists to manage medications and social workers to ensure a smooth transition home upon discharge,” said Dr. Ted Chan, MD, chair of the Department of Emergency Medicine at UC San Diego Health, in a statement. “Our goal with the SECU is to lower hospital admissions and readmissions in this patient population,” he added. This month, HIMSS Media’s information brands Healthcare IT News, Healthcare Finance News, MobiHealthNews and HIMSS TV will dive into one of the most pressing issues facing healthcare today – the baby-boom generation and its swelling demands on our system.